Over the past couple of weeks I have been making a huge effort to have a spring clean and a good clear out. I love having a super clean room and office space. The cleaner and tidier I am the more organised I am and the better I work. I am usually really tidy as it stresses me out when my space is untidy and full of clutter. But the one place that I have found really difficult to organize lately is my wardrobes. I don't like parting with my clothes especially if they have sentimental value. For ages I kept getting so far, then getting overwhelmed and stopping. This was really slowing me down in the mornings and resulted in me washing and wearing the same few outfits over a couple of weeks. A bit pointless when I have two wardrobes and a clothing rail in my room full of clothes and where's the fun in that. I knew something had to be done and soon because by this stage it was getting on the scale of the bridesmaid dress wardrobe in 27 Dresses. a. Clean, tidy and organize the room where your wardrobe is stored because it is about to get very messy. b. If like me you find it hard to part with your clothes ask your Mum, sister or best friend to help you out. Someone who will be brutally honest about whether you should keep an item of clothing or not. c. Before you start have a quick scan of your wardrobes and start to remove any empty hangers and create a pile on your floor out of the way. d. Take out every piece of clothing you own and try them on. If you try something on and you instantly love it and it looks good on you then its a keeper. Make sure its clean and has no stains or damage. If its dirty or stained put it into your washing basket or create a dry cleaners pile. If it needs to be repaired create a pile for repairs. e. For the clothes that you absolutely love and are keeping place them on the correct hanger and place them on a spare set of empty rails or on your bed until you wardrobe is empty. f. As you go through your wardrobe you will begin to find items that you haven't worn in ages and maybe even forgot about. Check for stains and damages. If they can't be repaired create an other pile which needs to go in the bin. g. Don't hold on to stuff if they don't fit or you haven't worn since secondary school. If they are in good condition but the love just isn't there any more donate them to charity or sell them on depop. h. Now that your wardrobes are empty, wash the clothes that need washing. While they are washing organize everything else that can go straight back into your wardrobe. Try using the same hangers as this will make you closet look more minimal a fresh. i. With the hangers matching and evenly spaced: the clothes are organized by category, style, colour and sleeve length. This makes it so much easier to see what you own and know if you are buying to much of the one colour with the exception of black. j. Prepare a bag for the dry cleaners, tailor and charity shop and place them in your car to you wont forget to drop them off. k. After you have tackled your closets, move on to your chest of drawers and shoes throwing old lingerie and sock straight into the bin. 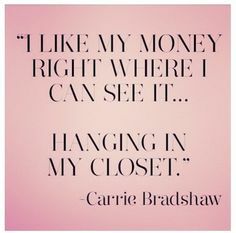 Now that you have all the extra space and can see clearly everything you own you have the perfect excuse to go out and treat your self to something new! As if you needed the excuse!